I decided to run in my Vibrams today. 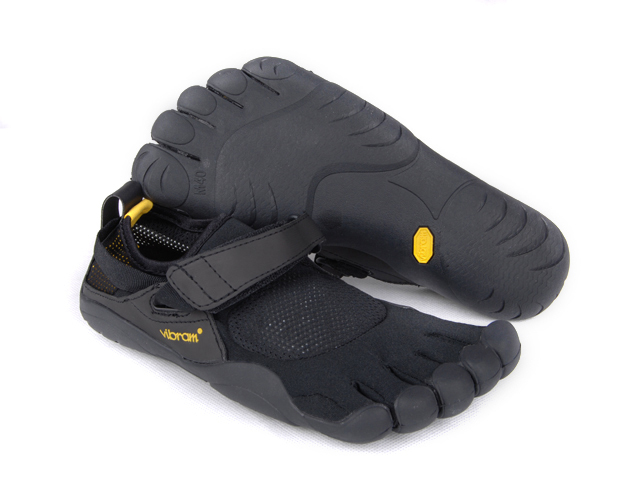 For those unfamiliar, the Vibram Five Fingers are like foot gloves. My wife calls them “gorilla shoes”, and I agree that they look ridiculous. Looks aside, the shoes provide protection from the ground but no cushioning or support, meant to simulate running barefoot. When I’ve run in them on the concrete, I’ve found that I was more sensitive to the pain in my feet. At several points, I wondered if I was going to injure myself of develop plantar fascitis, a common accusation against barefoot shoes (though it is also argued the other way). However, I also have never enjoyed running so much as when I run in my Vibrams on grass. I actually felt like I was flying at one point, and thought to myself, “so this is what people mean when they talk about the ‘joy of running'”. Because of these two conflicting feelings, every time I run I am torn about which shoes to wear. I am planning to run a 10k in a few weeks on the concrete, as well as the 10 mile Mudder on softer, uneven terrain. So do I train in my Sauconys (to cushion my feet from the concrete) or my Vibrams (to strengthen my feet and get used to running on uneven terrain)? Today I picked a course that had a reasonable amount of grass paths, and planned to run until I hit 5 miles or my feet started hurting. I hit 5 miles first and felt like I could have gone 5 more. We’ll see how my feet respond. But running in my Vibrams almost made me enjoy running. And I’ve never said that before. I finished the workout with stretching, 30″ box jumps, and then a CrossFit triplet of bench (135#), pullups and ring dips. Question: Anyone actually enjoy running? What makes it so enjoyable? This entry was posted in Fitness, Tough Mudder and tagged running, tough mudder, vibram five fingers by Justin. Bookmark the permalink. So you like them, eh? I’ve always wondered. I read Born to Run and was convinced, but I haven’t bought them myself. I’m too lazy to go through the “retraining” program to get my feet used to no cushioning. Myself, I have a love/hate relationship with running. I especially like it when I get lost in my own head and forget I’m running. I also like it when I have those where it feels like I could go on forever. It’s also kind of a release time. Often this is the break that I get from taking care of other people all day, and it’s kind of nice. Yet, it’s work. I don’t think it’s ever NOT work; you have to get your heart rate going, legs pumping, work out any left over lactic acid, regulate breathing, etc. And work is, by definition, difficult. So…there you go: love/hate. However, the good beats out the bad and keeps me pounding the pavement. Holly, I love this comment! It could be a blog post in and of itself. Sometimes we think that work and joy can’t coexist I think. I just got back from a relatively light run today, but in the heat, it was the hardest one yet. In other news, I just saw Dustin, Cyril and Ben Devries last Sunday.